The British National Party has elected its first district councillor in Lincolnshire after winning a by-election in Boston. David Owens won the seat by a 138-vote margin over Carl Smith of the Boston By-pass Independent Party. Mr Owens, who won the Boston Fenside ward with 279 votes, said the people of the town wanted a change. The council is controlled by Boston Bypass Independents, who have lost six councillors since 2007. 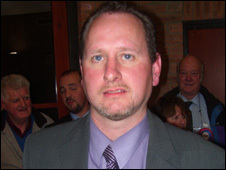 The independents, who won control of the council in May 2007 after a campaign promising a by-pass for the town, have had four defections to the Better Boston Party and two by-election defeats. The turnout in the by-election was 22%, polling officials said. Conservative Paul Mould of the Conservatives was third with 119 votes, Norman Hart of Labour had 69 votes, Cyril Wakefield of the United Kingdom Independence Party had 24 votes, and Gavin Carrington of the Liberal Democrats had 23 votes.